Thank you Mary for sharing with us this very interesting map. I am sure the not so brilliant Palestinian Trio of Arafat. Abbas and Qurai, who negotiated Oslo never bothered to look at any kind of map. Just imagine that Qurai approved and agreed to include part of the city boundaries of my home city of El-Bireh in Area C thus allowing Israel not only to build but to expand its settlement inside the city boundaries. Sometimes I wonder what the hell these guys were thinking when they negotiated Oslo. Certainly they were not looking for liberation but desperate to conclude a management contract that allows them to line up their pockets. Oslo shifted the financial burden of the Jewish Occupation from Israel, shifted it to the Palestinians who had to go out and peg the world community to keep the money flowing. Of course Israel kept the benefits of the occupation to itself including confiscation of lands to expand settlements. When we think about it, the PLO and the Palestinian Authority is the second largest financial contributor to Israel and its occupation after the US. Very clever from Israeli side, but very stupid from the Palestinian side. Thank you Mary, especially when the PLO Ambassador in Russia for Palestinian people HE Afif Safieh is no longer going to be in his position from the end of May. The self-proclaimed head of Palestine Authority is adamant to continue remaining in power with the support of Israel and USA although his term is finished on 9th of January this year. What two-state is he going to form with Palestine quite clearly turned into more than bantustan fragments as in this map? He has asked Europe to shun Hamas, whereas Mr Safieh’s record of struggle in Washington, in London in his previous role as a brilliant Ambassador was and always has been to unite all parties of these people against one common Oppressor, the state of Israrel. Gaza is no included in this map, is this in error? It is such an incredible map, and I agree with both of you, that it should be seen by anyone who has any kind of decision making capacity for “final status” resolutions. It is clear as it can be that no state could ever exist in conditions of this sort, unless it was Green and really surrounded by just the sea, but alas, the blue parts are hostile military outposts, walls and toxic garbage sites. (although as Reham says, the toxic wastes are dumped to Palestine, while the water treatment plants get on the “Israeli” side of things). 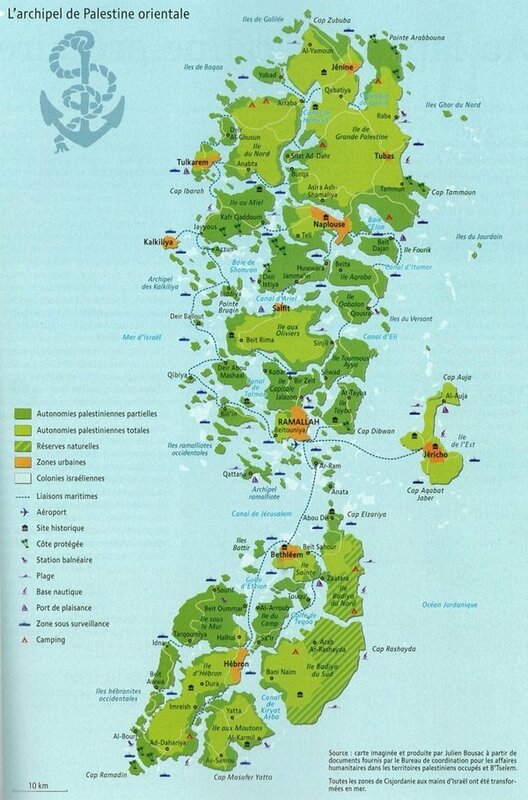 Would love to see the “Israeli” version of this map. I can’t believe you are saying the Palestinians are “stupid.” You have people armed with rocks up against the 4th most powerful military in the world. What REAL options have the Palestinians EVER had in this conflict? Of course no one wanted Oslo and I am quite certain many on the Palestinian side knew it was a sham, but what was the alternative? Tell me that! There was the Saudi Peace proposal, there were the Geneva Accords. The Geneva Accords were somewhat reasonable, perhaps, given the circumstances. Israel will not allow any solution unless is means they get ALL the land and get rid of the Palestinians. As long as that is Israel’s goal and they have all the power, it matters little what the Palestinians do. You are blaming the victim. I suppose to you it was the Indians fault the Americans colonized their land? Was it the Africans fault that American imported them as slaves? Maybe is was the black Sourth Africans fault they were under Apartheid? Try taking reality into account before you criticize. Wonderful islands, shame about the man eating shark-infested waters. Nice job – really highlights what “moral” Israel has done to the indigneous Palestinians. As long as the Zionists are in the Middle East they will live in a constant state of alert and sleep with a gun by their side, they will never have peace. What was won by the gun will be lost to the gun. I will never see a free USA or a free world but do hope to see a free Palestine. we are made to think for ourselves individually thats the beauty of our lives on earth. when oslo talks were announced in ’93 i had been mightily saddened. in a letter to editors i vaticinated a political disaster for palestinians ensuing fromsuch ‘talks’ [a diktat wld be a better term]. natch, the letter and a hundred others before/after oslo had not been published. nevertheless, at the end palestinians, rejected the untouching remnants of ex-palestina. i an not sure how much was ‘given’ or returned to pals; perhaps, just 15%. have palestinians since ’93 changed their minds about how much they wld accept? in ’93, they insited on 22% of palestina. however, palestinian leadership may have espied that they won’t get anything no matter what they do or don’t do and have thus opted to lead the US/israel evil soyuz by the nose. meanwhile, they are getting some moneys, which is better than no money and no country, anyway. PA has seen correctly, that any resistance, even political one, wld only worsen the situation. they, too, may have seen, that armed resistance is actually desired by ‘zionists’. so all they can do is to ‘talk and talk and talk’, while israel will issue diktat after diktat; keep expanding, etc. but at the end, i firmly believe, they will not accept less than 22% of ther former homeland. i also think that US/Israel knows this. Cheryl. Whether we like or not we do have to admit that we the Palestinians have the most stupid, idiotic, corrupt, inept, incompetent and failed leadership and it has been the same for the last 45 years. Arafat, the PLO all are nothing but a fraud. With an enemy like Israel, and with so many brilliant, well educated in the hundreds of thousands all over the world, we end up with guys like Abbas, Qurai, Abed-Rabou, Saeb and the like as leaders, of course we do have a serious problem. Our problem is not only Israel, or the US but the leadership we have. With all due respect, they are simply stupid, corrupt, incompetent and total failure. Do you think the guys who negotiated Oslo without knowing what they were doing are competent and capable to negotiate an end to the Occupation? Never. They have been negotiating now for over 15 years and the more they continue to negotiate, the more Israel takes and the less is left. I think the present leadership will continue to negotiate till there is nothing left to negotiate. Abbas and Qurai negotiated the legal basis for the settlements by agreeing to areas A, B, and C, and Saeb and Dahlan negotiated the Gaza crossings and the siege of Gaza. Forget it, the two states solution is not longer a viable option; sue for a one state solution now. Don’t waste time. We need to rethink our strategy from A-Z. after all, there are so many educated and worldly arabs from Palestinian region who can take the corruption and put it where it belongs .. in the closet. But nobody wants the job..
all they do is multiply and thrive…. they really have not advanced even there are universities in their ‘hoods..
A BIG NO THANK YOU!! The map is incredible and stunning. The tragedy is what awaits the children. It is always the children. I don’t think that the leadership of Fatah, Hamas, Israel, or the U.S. have the wisdom to bring peace and justice. The Anglo American Empire is collapsing along with capitalism. Perhaps a better day can come. But I cannot believe it will ever arrive through the barrel of a gun. One question to any Palestinians reading this comment – what do you think of Fayad, the Prime Minister of the Palestinian Authority? I do agree with Jerry. It is quite right to say that it is the children suffer the most with no vision of the future. They were born in very poor, unhygenic, crowded, always on the alert, with no freedom environment, when they come to age with hatred accumulated in them cannot but reject the occupation and division of their homeland. I have a friend of jewish faith in the UK, when I left London for Germany, he told me Mahmood “I will never come to see you in Germany because what the Germany did to my family I cannot forget and forgive”. We should forget but should forgive so as to bring Peace on this Planet. Not all Jews look at Germany that way. Some Jewish schools sends kids on trips to Poland and sometimes even Germany, as well as Israel. We hate Nazis and neo-Nazis, but not the Germans. We don’t have an eternal hate for them. I’ll use the Book of Jonah as an example. Jonah hated the Ninevites. God wanted them to repent, but Jonah wanted them dead because he hated them. They were bitter enemies. So he tried to flee in the other direction. But God wanted to give the Ninevites a chance to repent. It might have put Jonah in a cruel situation, giving the people he hated so much a chance to live, but repentance is what God wants. So Germany isn’t Nazi Germany anymore. I’m sure you guys are waiting for the day the Palestinians aren’t occupied. I had a German soccer coach, in my Jewish high school. I have a friend who speaks German and goes to Germany all the time. My friend’s wife is a convert to Judaism from Germany. Her grandfather was actually a concentration camp administrator. So perhaps when peace is made, when a Palestinian state is created the children of settlers who want to live in Judea & Samaria/West Bank, can buy land and live as residents and follow the path to citizenship. I’m sure some of you want a Palestinian state over Israeli ’48 borders. This message is not directed toward you so no need reply. Capitalism is not on the decline. The reason we live in such high living standards is because of investing/capitalism. It goes up and down, but over all, it goes up over time. All it needs is regulation. As a Christian, I have always had deep faith in God and the bible. However, as I grow older and wiser, I realize something is just not right; either God’s word has been corrupted by man or He showed really, really poor judgement. Chafeeka. Frankly I never could understand why after 60 years of exile, we the Palestinians are not masters of our own destiny. Who would believe, and with all due respect to UNRWA and UN agencies, we do not have our own agency that takes care of the Palestinians need all over the world? Who would believe that thousands of Palestinians remain stranded on the Iraqi/Syrian/Jordan borders without any one from any Palestinian organization even bothered to go and see what they can do to help these miserable people. Not the PLO which suppose to represent All Palestinians bothered to send representative to help and arrange with other nations to take there people. Tens of thousands remained stranded for more than a year on the Egyptian-Libyan borders and no one from the PLO including Arafat bothered to help. Yes, I believe that the PLO and its leadership not only have corrupted our people and our intelligencia but have committed serious crimes against the Palestinians people. Who would believe that the PLO never opened formal investigations in the murder of more than 5,000 Palestinians, who died in Tal-Zaater, and the thousands gunned down in Sabra and Chatilla and the hundreds massacred in Jenin. This present leadership is known to have stolen billions of the people money and have become a contractor for the Jewish Occupation. No way for liberation before we are able to get rid of the PLO and the present leadership and totally re-invent ourselves and have the needed commitment for liberation. With the kind of leadership we have whether Fatah or Hamas I do not see any hope? I think national salvation has to come from the Palestinians community living in Europe and the US, certainly not from within the Arab world. Time to drop and discard 45 years of consistent failure and start anew. There has to be a grass root movement that demands change and new leadership. With Netanyahu-Lieberman I think it is best for Abbas and Fayyad to hand over the keys of managing the Occupation back to Tel-Aviv and let Israel pay the bills for the Occupation instead of expecting the Palestinians to go out and plead with the world to fund the on going Jewish Occupation. On the other hand and in reference to biblical upheavels and floods.. I could go with that….